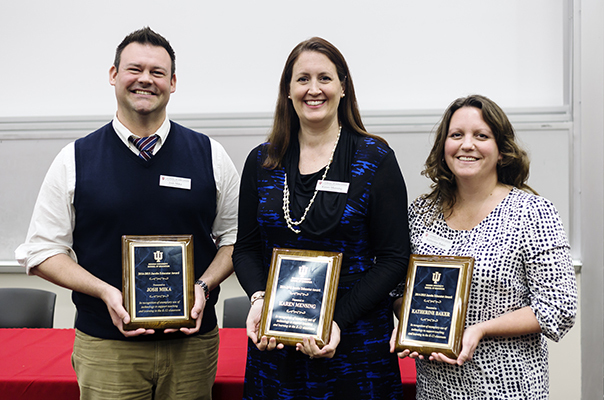 Josh Mika (left), EdD ’13, receives the Indiana University School of Education’s Jacobs Teacher Educator Award. Josh Mika, EdD ’13, is one of four teachers from three states to receive a Jacobs Teacher Educator Award from the Indiana University School of Education this year. The annual award honors teachers who use technology to support innovative, inquiry-based teaching and learning activities in their classrooms. Mika, a teacher and librarian at Beebe Elementary School in Naperville, Illinois, implements inquiry-based learning with K-5 students in the classroom through his lesson plans and utilization of the school website. He also utilizes the school website in hopes of engaging students outside of the traditional school day, which is something he learned while completing his Doctor of Education degree at Aurora University. Along with providing his own students opportunities, Mika looks forward to giving back through the Jacobs Teacher Educator Award, including contributing to the video repository of best practices for teachers. These how-to videos give teachers information on classroom procedures and lesson planning for various topics.